Adelaide, July 30, 2018 AEST (ABN Newswire) - Emerging lithium developer Core Exploration Ltd ( ASX:CXO) ("Core" or the "Company") is pleased to announce that it has entered into a non-binding term sheet with one of China's largest lithium producers, Shandong RuiFu Lithium Co Ltd ("RuiFu") to supply up to 150,000tpa of lithium concentrate offtake, and receive a US$35 million pre-payment facility for its 100% Finniss Lithium Project near Darwin in the Northern Territory, together with RuiFu making an investment of approximately $3.0 million in Core ("Term Sheet"). o Placement for approximately $3.0 million to RuiFu at 5 cents per share, resulting in RuiFu holding a 10% interest in Core. o Offtake of up to 150,000 dry metric tonnes (DMT) per annum of lithium concentrate produced from the Finniss Lithium Project (subject to Core's contractual commitments to Yahua) for up to five years. o Pre-payment to Core up to US$35,000,000 of lithium concentrate to be purchased under the Offtake Agreement. o Payments to be advanced to Core in stages as key development milestones are achieved. o Placement of shares in Core at 5c to increase RuiFu's shareholding to 10% of Core's issued capital. 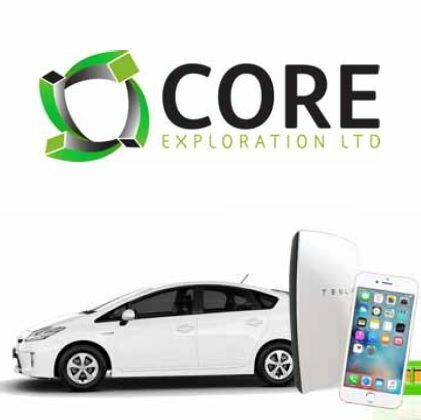 o Based on the current issued capital of Core, the Placement to RuiFu is expected to be in the order of $3.0 million (~60m new ordinary shares) for further development of Core's lithium resources. o The Placement will be undertaken under the Company's issued authority under ASX Listing Rules 7.1 and 7.1A. Commenting on this significant milestone, Core's Managing Director, Stephen Biggins, said: "This funding and concentrate supply Term Sheet with RuiFu, along with our existing prepayment agreement with Yahua, sum to US$55M in pre-payments, and has the potential to provide the funding solution for the relatively low capex required to get the Finniss Lithium Project into production." "The execution of the non-binding Term Sheet not only validates the high quality of Core's Finniss Lithium Project but also the strong success Core is having in developing relationships with some of China's largest lithium producers." "As we progress this project towards development we are continuing to build relationships with potential offtakers from China, Korea and Japan." 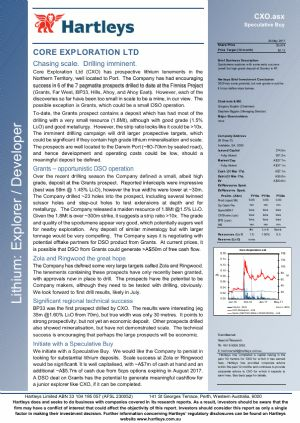 "We see the development of Grants as just the beginning for Core, as we anticipate Core's bank of Mineral Resources expand in the future, and our entry into production should be well-timed to coincide with what we see as rapidly increasing global long-term demand for lithium batteries." A number of terms remain to be negotiated by the parties, and the full details of these discussions remain confidential, however strong progress has been made in establishing the core commercial framework for these the agreements, and each of Core and RuiFu are committed to expeditiously concluding binding agreements within the next several weeks. Shandong RuiFu Lithium Co Ltd ("RuiFu") is one of China's largest lithium producers and is a subsidiary of A$3 billion market-cap Shanghai-stock exchange listed Meidu Energy Co., Ltd.
RuiFu was established in 2010 and is one of the largest processors of lithium from lepidolite and spodumene, and produces and sells battery grade lithium carbonate, industrial grade lithium carbonate, anhydrous sodium sulphate, aluminium silicon powder, and other products. RuiFu markets its products throughout China. 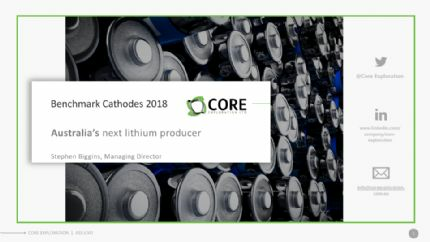 Core Lithium Ltd (ASX:CXO) is an emerging lithium producer focused on development of its Finniss Project near Darwin in the Northern Territory. Core owns 100% of Finniss, a major developing project that lies close to existing infrastructure such as the Darwin Port, grid power, gas and rail infrastructure. The Finniss Project covers a 500km2 tenement holding and 25 historic pegmatite mines. The project area is about 80km from Darwin Port. Exploration work has generated a near term development timeline, with feasibility studies to be completed over the course of 2018 ahead of receipt of approvals in early 2019 and planned first production during 2019. An aggressive exploration program is under way, which has confirmed the high quality prospectivity across much of the Finniss Project area. 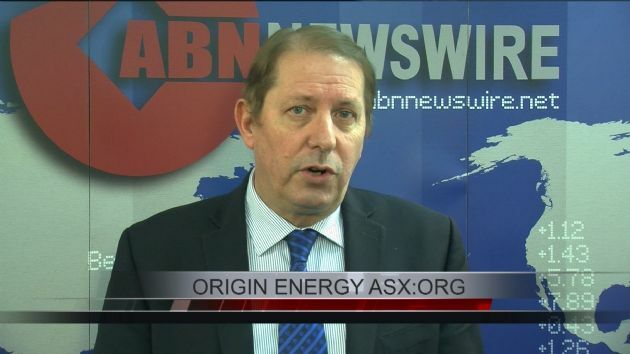 Core's stated ambition is to upgrade Finniss' resource base to fast-track commercialisation options.